Master-pellet containing nanozirconia particulates (below 100nm) in a Fe granulates with a size between 0,2 and 0,7 mm compatible with industrial casting processes has been developed. This master-pellet can be handled like conventional inoculants and additives in foundries. 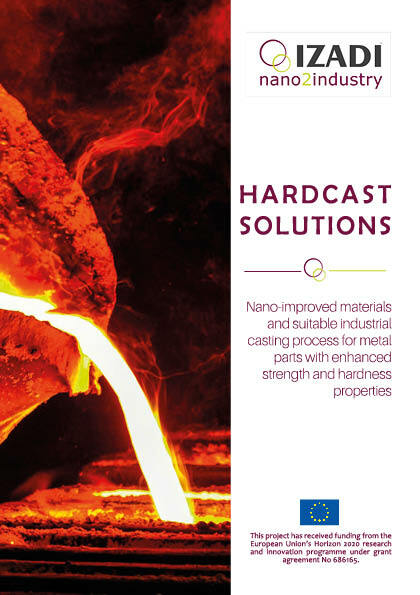 The same concept as the nanozirconia with nanoTiC has been obtained and the master-pellet containing nanoTic particulates in a Fe granulate with a size compatible with industrial casting is in progress. The process for production of nanoreinforced ferrous components through casting route in foundry environment has been defined. The process should be validated in the pilot defined for this purpose in the following months. Read the complete results of HARDCAST PILOT!